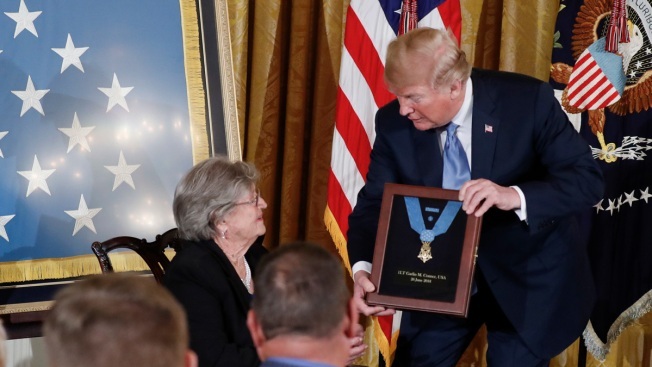 President Donald Trump awards the Medal of Honor to 1st Lt. Garlin Conner as his widow Pauline Connor accepts the posthumous recognition, during a ceremony in the East Room of the White House in Washington, Tuesday, June 26, 2018. Conner is being recognized for actions on Jan. 24, 1945, when he left a position of relative safety for a better position "to direct artillery fire onto the assaulting enemy infantry and armor." Conner remained in an exposed position for three hours, despite German forces coming within five yards of his position and friendly artillery shells exploding around him. President Donald Trump is awarding the Medal of Honor to a deceased Army intelligence officer who showed gallantry during World War II. The widow of 1st Lt. Garlin Conner is accepting the posthumous recognition Tuesday for her husband's valor on the battlefield. Trump is hailing Pauline Conner's late husband as an "incredible hero" who is taking his rightful place in the "chronicle of American valor." The White House says Conner is being recognized for actions on Jan. 24, 1945, when he left a position of relative safety for a better position "to direct artillery fire onto the assaulting enemy infantry and armor." Conner, a Kentucky resident, remained in an exposed position for three hours, despite German forces coming near his position and friendly artillery shells exploding around him. He died 20 years ago.